Started in the late 1980s as a personal mission of several local ski enthusiasts, the Acadia Winter Trails Association (AWTA) formally partnered with Friends of Acadia and Acadia National Park in 1990. FOA began providing regular financial and fundraising assistance to the loyal groomers, and the park added maintenance and other support. Gradually, homemade grooming rigs (bed springs and cinder blocks) were replaced with specialized equipment. In 2005, the family of Elizabeth R. (Leila) Bright established an equipment fund and an endowment in Leila’s memory and in honor of her love for skiing in Acadia. 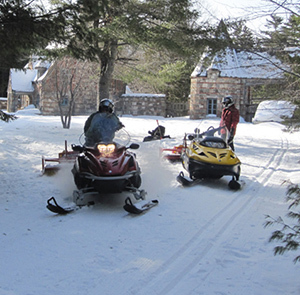 These provide annual grants to underwrite the purchase and maintenance of grooming equipment, safety training and equipment, fuel, volunteer and staff training and support, and other annual and capital needs of cross-country trail grooming in the park, supporting grooming activities in perpetuity. With the additional equipment and program support, an expanded cadre of volunteers has been able to groom more ski routes—including the Aunt Betty’s Pond, Around Mountain, and Witch Hole carriage roads—sooner, taking full advantage of Mount Desert Island’s unpredictable snow season. Two teams of volunteers now operate from bases at the Hulls Cover Visitor Center and the Brown Mountain Gatehouse, setting tracks for classic and skate-style cross country skiing on routes established in the grooming agreement with the park. See the below map for route details. The volunteers typically log hundreds of hours per season keeping Acadia’s carriage roads primed for skiers. Although the Bright Endowment provides significant long-term stability for the Acadia Winter Trails Association, it does not currently cover the entire cost of the program or allow for extra fuel costs (whether due to higher gas prices or wicked snowy winters!). To help support this program, contact Lisa Horsch Clark at 207-288-3340, or donate online now. Please keep in mind that grooming is done by volunteers of the Acadia Winter Trails Association and must be done at times that are both convenient and safe. Volunteers may groom the carriage roads if new snow exceeds six inches and the road bed is frozen. The routes listed on the map below are in priority order for groomers. Staff will post grooming reports as soon as possible, but you can help us keep information current on Facebook and Twitter! Use the social media hashtag #SkiAcadia when posting updated conditions or searching for the most recent grooming information. #SkiAcadia Long stretches of glare ice, and bare spots are now being seen on carriage roads throughout the park. Heavy rain expected for Friday will cause washouts and further deterioration. Sad to say but official grooming reports have come to an end for the season. Thank you to all our volunteer groomers from the Acadia Winter Trails Association and our friends and supporters for making this program possible. 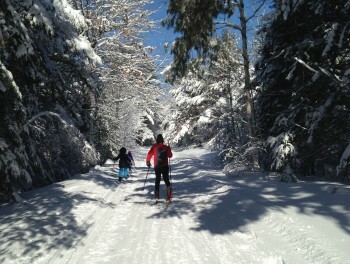 If you enjoy skiing in Acadia National Park, please support the winter trails equipment fund with an online donation. Include “AWTA” in the comments field when you make your gift. Thank you! Following the construction of new multi-use trails at the Schoodic District of Acadia, there has been interest in using those trails for cross-country skiing. There is not currently a grooming program at Schoodic; however, skiers are encouraged to break trails and share information about conditions on Facebook or Twitter. Use the hashtag #SkiAcadiaSchoodic when posting or searching for information specific to the Schoodic trails. 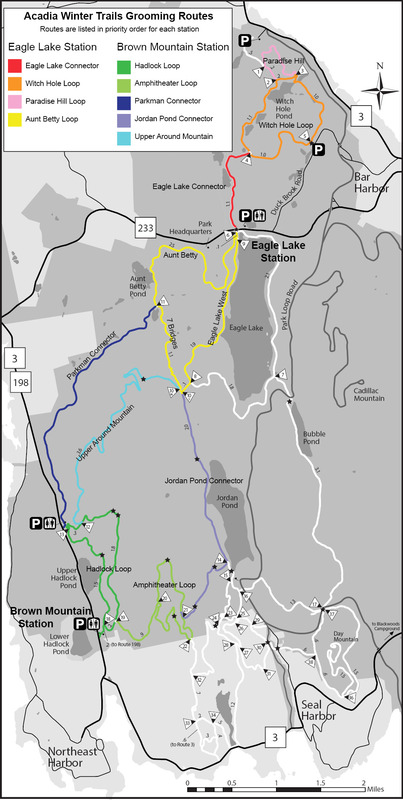 A map of the Schoodic trails can be found on the park’s website. Note that FOA and the park are in conversations about expanding the AWTA grooming program to Schoodic. There are multiple pieces to that puzzle that will need to be in place so there is not yet a target date for the expansion. Stay tuned.